When we had the original idea it cost us just two buckets of whelk's to get our very first Oak whisky cask back in 2007. Since those days how things have changed, we now get the vast majority of our Casks direct from the distillery's. This is the reason we can officially Include with all our pens a Certificate of Authenticity. When we get a new Cask in. We first dismantle the Cask then check all the stave's individually. We then cut into the pen blanks needed for making and turning the pens, ensuring at all times we keep the very best of the grain pattern and colours produced when the cask was full of Whisky. 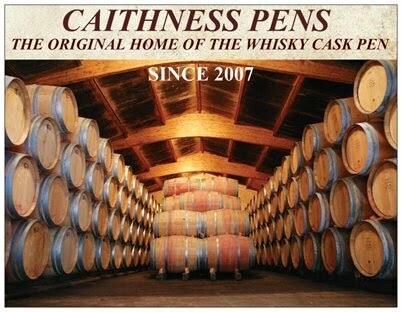 Whisky Cask Pens make a truly unique gift for any Whisky lover. We also now make other gifts from whisky staves, including wee drams, keyrings and tea light stands. we can also take special orders if you have something in mind please get intouch. Most of our Casks are over 200 years old.